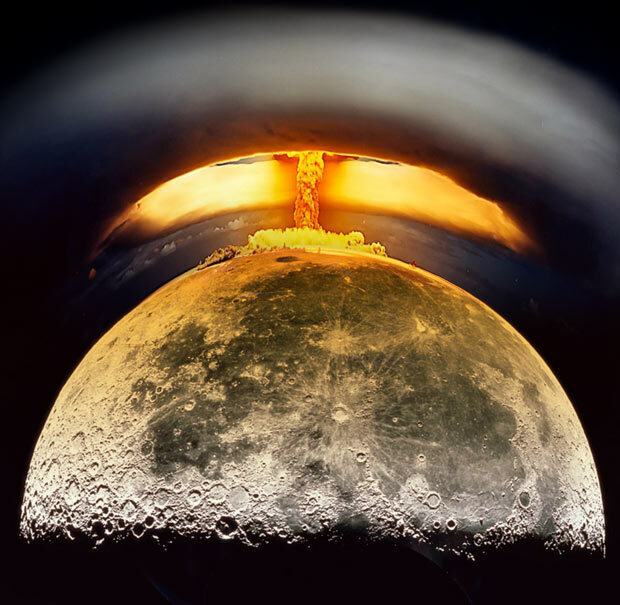 It’s official – the US Air Force had a plan to nuke the moon. According to a declassified report obtained by CNN in a story that aired on November 28, the Air Force plan involved sending a nuclear missile that would detonate on impact with the lunar surface. The aim was apparently to respond to Soviet success in launching Sputnik I, and showing that the US had a capacity to send rockets to, and eventually from the moon. The project was titled “A Study of Lunar Research Flights” (aka “Project A-119”) and was planned in 1958. According to the declassified report, the plan was never implemented, and was abandoned one year later due to concerns over the effect of nuclear radiation on the moon, and a public backlash. According to one senior US Air Force officer, however, not only was an attempt made to detonate a nuclear bomb on the moon decades later, but there was an external intervention to destroy the missile. The thinking … was that if the Soviets hit the United States with nuclear weapons first and wiped out the U.S. ability to strike back, the U.S. could launch warheads from the moon. We didn’t want to clutter up the natural radioactivities of the moon with additional bits of radioactivity from the Earth,.. Project planners also weren’t sure of the reliability of the weapons, and feared the public backlash in the U.S. would be significant. So if Reiffel and the 1959 report is accurate, then the plan to nuke the moon was never attempted. Or was it? According to a retired USAF Colonel, not only was an attempt made to nuke the moon, but there was UFO intervention to destroy the missile soon after its launch. I was a staff officer for the military liaison committee between the chairman of the AEC [Atomic Energy Commission] and the Secretary of Defense…. During that period of time [early 1950s] one of my functions was to accompany a security team which visited all of the nuclear facilities to check on the security of weapons…. I was assigned to the Unified Command under Admiral Felt during the ‘60s. I was the officer in charge of the Alternate command post involved with nuclear weapons operation planning. During that period of time, I maintained contacts with NORAD, with the SAC operations, and was involved with operational plans for the use of nuclear weapons. Who was it that destroyed the nuclear missile aimed at the moon, and interfered with other nuclear weapons tests by the USA? According to Dedrickson, the missiles were destroyed by UFOs that he believed were manned by an extraterrestrial intelligence. Dedrickson’s remarkable claims are backed by other retired USAF officials that state that US and Soviet nuclear missiles were regularly interfered with by UFOs since the dawn of the nuclear era. In conclusion, we know that the USAF did officially conceive a plan in 1958 to launch and detonate a nuclear missile on the moon. Apparently, “Project A-119” was abandoned one year later. If Colonel Dedrickson is accurate, however, then Project A-119 was either resurrected decades later or a new project was conceived with a similar goal. The timing of the later project, in the late 1970s/early 1980s, suggests the nuclear missile attempt may have been related to circumstances surrounding the end of the Apollo lunar missions. According to some whistleblowers the USA was not “allowed” to return to the moon by an extraterrestrial intelligence based on the moon. It appears that there was indeed an attempt to send a nuclear missile to the moon by the USAF, and that it was destroyed by some external agency – UFOs and/or extraterrestrial intelligence – closely monitoring nuclear weapons testing on Earth, outer space and the moon. Permission is granted to include extracts of this article on websites and email lists with a link to the original. This article is copyright © and should not be added in its entirety on other websites or email lists without author’s permission. Will the Cassini Space probe be used as a nuclear trigger to ignite Saturn and terraform its moons for human colonization?